I was going through some random USB sticks the other day and found the one with our freestyle video from USDF Nationals in 2017. I'd actually never seen the video, so it was a nice surprise! Sound on for Star Wars! Watching this is a little bittersweet - Nationals was such an amazing experience, and I wish we'd been able to go back. I think about how far we've come since then, and how much I wish we had been able to do a second and third level freestyle. I had the music all picked out and the choreography sketched out too. Sniff. All this is just to say, create wonderful memories and cherish them (like I will never forget that spook at A, because REALLY TARAN???). Do the things you want to do with your horse now, because you just don't know what tomorrow holds. One of the problems with R+ (clicker) training is that your critters become very treat-motivated, and start offering all kinds of behaviors unasked for. Of course, our animals have been trained carefully and correctly and would never, ever do this. Hahahahaha. Let's take Leo for example. He's gone from a reactive baby horse to one who actively seeks out humans doing weird things. Which is good, I guess, but makes it a little challenging when you're actually trying to do things. Guy in clanky metal stuff carrying stabby thing might have cookies. This guy is wearing EVEN MORE clanky metal stuff but who cares, he might have cookies. Also we should stop and check to see if this guy wearing weird clothes and standing on a mounting block with a stabby thing has any cookies, even if we are supposed to be walking past him. Charlie knows that if she follows us when we go for a walk down the street, we will abort our walk, scoop her up, bring her home and give her a can of food. This distracts her long enough so we can make our escape sans kitty. Our husky, Logan, has figured out how to rest his chin on things and lay his ears back so that he looks completely adorable and irresistible and you absolutely must pet him immediately. Can you resist this? No you cannot. Or this. I just want to pet the picture it's so cute. Clearly we have trained Logan very well so that he does extremely cute things to be petted. Or something. And then there's Paddy, the original human trainer. He's even trained this unknown human to give him cookies by looking cute. Sooooo.... how's that R+ thing working for you? As you might have guessed from the lack of Taran posts, things are not going quite as well as we had hoped after the ProStride injection in his RF coffin joint. I'm not even sure how this horse did what he did. We gave it a full month to take effect, but... he's not sound. Or I should say, not sound enough for much other than walk work. The haffies hate it when he goes for hand walks by himself. So... we've been doing some tack walking to keep him from going stir crazy. Except, last week when we went out he took off at a MONSTER (lame) extended trot, stuck his nose on his chest, and took off bucking. I stayed on, but it was a little sketchy there for a minute. The other day I put the boys out to graze for a few minutes while I was doing chores, and when I called everyone in for dinner, Taran gave me a big old EFF YOU. The haffies all came running for food, but T just... well, ran. Like an idiot. Bucking, spinning... clearly whatever is bothering him isn't bad enough to stop him from doing dumb stuff on his own time. Admiring yourself in the mirror seems like a much more reasonable occupation SINCE YOU'RE LAME. He's driving the other horses absolutely bonkers, because he gets everybody all riled up and then they just run and run. For some reason, he especially likes chasing Griffy, who is not super excited about Taran's attentions. Unfortunately, T seems going back to his bullying ways, I think because he's not getting as much attention and exercise as he is used to. Also he never gets any cookies anymore. We discussed options with the vet, and at this point we would need to have MRIs done of both front feet to really understand where we're at, and then formulate a treatment plan. And... well, based on his history (nail through coffin and navicuar bursa in 2011, super-thin soles, ongoing struggles with Cushings, etc), we've made the decision not to pursue additional treatment options. Haflinger companions are an excellent treatment option. Also moar cookies. So technically he's retired, in that we're not going to be pushing toward 4th level or any other sort of goals. When/if he's sound, I'll do more with him riding-wise, and when/if he's not, we'll just tack walk. I have no agenda and no schedule for him. If at some point in the future, he's 110%, maaaaybe we'll think about legging him back up for competition. Maybe not. We'll take each day as it comes. Honestly this is fun too, when he's not spinning and bolting away from the terrifying bunnies. I rode him last night WTC both directions for the first time in two months, since he was feeling pretty good (a little NQR here and there, but overall good). 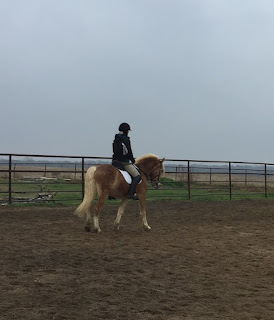 We worked on straightness, balance, and self-carriage (fortheloveofgodineedtoletgooftheinsiderein), which honestly are things I will always need work on, but it felt good to work on ME and not have to worry about riding a baby. It was also kind of amazing to have power steering and brakes, and remember what a horse who is truly over his back feels like to ride. Not to mention feeling his biiiig, powerful, rolling canter under me again, even for just half a circle. (Ok I know it's not that big in the grand scheme of things, but it feels light-years different from Leo's flat unbalanced racy baby canter.) Oh, and the bucks were nice too. So that's the state of things in Taran-land. He's retired, sort of... but maybe not really? Yeah buddy, I feel the same way. Leo and I went to a local schooling show this weekend, his first one ever. 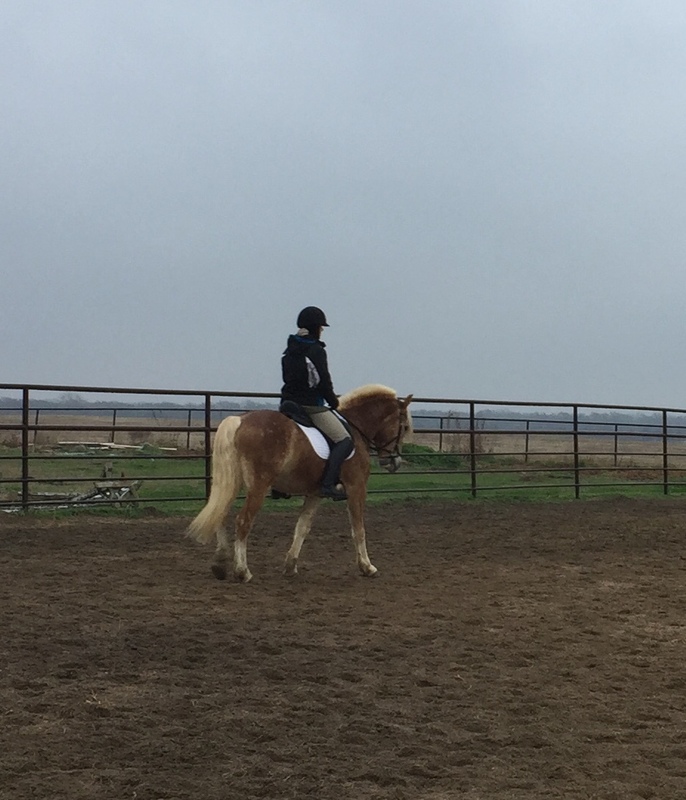 We'd signed up for Intro A and Intro B, because I wanted to keep things super low-key and make the experience very positive. Late Thursday night, we had a cold front move in, so it rained and sleeted all day Friday and I don't think it got over 35F. This is enough to make me want to crawl into a blanket fort in front of the fireplace and not come out for a month. Saturday morning wasn't much better, 34F and raining. Warmup was in the outdoor and tests were ridden in the fairly dark, spooky indoor. As I tacked up in the rain, Leo got a bit anxious tied to the trailer as we were nowhere near any other horses. I've mentioned that we've clicker-trained Leo to target the plastic swords we used to practice with, and there happened to be one in the trailer. Hubby had the brilliant idea of doing some target work, and Leo immediately focused on the fun task and hand and calmed down. Another win for R+! I ended up hand-walking Leo all over the grounds, just to check everything out. He was interested in sightseeing but overall really chill. The only thing he looked at was a tarp covering a trailer hitch, but he marched over to it and touched it anyway. I got on with about 30 minutes until our ride time, and did a lot of walking before gathering up the reins and doing some trot work. We focused on staying relaxed, straight, rhythmic, and in front of the leg (all of which is like... super hard). He was actually really focused and soft, considering the wind chill and driving rain. The show was running a bit behind, so we ended up taking more walk breaks than I had intended. Eventually our turn came, and we headed over to the arena and went in. And... he was absolutely stellar. Sure, he called out once or twice, our transitions weren't all perfect, circles could have been rounder, etc. etc. But he stayed focused, soft, and relaxed, which was everything I could have asked for. There was this one part where he tried to exit stage left... someone's outside leg wasn't actually doing anything, apparently. Lookit the thing over there! We had a couple of rides before Intro B, so we mostly just walked around and practiced some halts. Unfortunately, by this time I'd been on him for an hour, and he was pretty much done. We went back into the arena and got the test completed, but he was sucking behind my leg and we had some sticky spots. It wasn't really ugly or anything, but it definitely wasn't as smooth as our first test. Still, he didn't look, only called once or twice, and generally did what I asked. Intro A, minus the walk part at the end because hubby's phone bricked due to the cold. Our final scores were a 71.5% on Intro A and a 69+% on Intro B, which was very generous. I have no idea how we placed, since we left right after we finished - but really, it doesn't matter. He was a super kid and there were no shenanigans. For our first outing, I'd call it a success! After Leo's minor meltdown on Saturday, we had a plan for our Sunday clinic ride to keep reduce his anxiety so we could get some work done. This involved parking Griffy in the arena with a haynet while I rode Leo which... was pretty much the magic bullet. Unfortunately, hubby had to take a work call so I have only a tiny bit of media for my ride. Have a random picture of us trotting. And yes I promise never to pair those breeches with that saddle pad ever again, you're welcome. We worked a lot on keeping a steady tempo, using very small corrections with my seat (and keeping my damn thigh on when I'm posting, that helps LOADS). When we had small steering issues (aka me pulling too much on the right rein), a small step in my outside stirrup straightened him right up underneath me. A moment of me riding off my hands rightfully resulted in a great deal of protest from Leo - he may be the horse that finally teaches me to ride with my seat instead! Because Leo spent 60 days at a colt starter before we got him, he has what is fondly referred to as a "huge stop". What this means in reality is that he might drop onto his forehand and slam on the brakes when asked for any sort of downward, which puts me in jeopardy of going off over his ears. He likely also spent a lot of time backing up immediately after a halt, so he tends to stop with his hind legs splayed out to either side, resulting in kind of a wobbly drunk-looking halt, often immediately followed by him backing up a step or two. We worked on stepping UP into trot-walk transitions, continuing the forward motion and staying in front of the leg. This is quite a challenge for him, but when I had everything organized and asked very softly, he was right there for me. And having the R+ "YES!" bridge available to me was a huge help too, because I could tell him when he had done it right. Getting a little more relaxed through the back and over the shoulder, let's not talk about my stupid inside hand. Since he was working so well, my confidence was high and I felt organized enough to canter. I had warned my trainer that she wouldn't like it much because it's on the forehand and lacks suspension, but actually our right lead canter felt quite good! We only did a few strides before asking him (softly, so softly, just exhale and NO HAND) to come back to trot and rebalance, and we did that several times each direction. Trainer's comment was he's simply unbalanced in the canter because he's young and got a fairly big stride for his size. For now, my homework is to do lots and lots of soft transitions to help him find his balance, but not to canter in endless unbalanced circles. Given the quality of his walk, she thinks the canter will improve some with time and training. Bit of a long video, but it's a good example of where we're at now. And no shenanigans, sorry! I clearly need to do a lot of work on my core in sitting trot - it's just up there wiggling around. The funny thing is, I can be really quite strong with it, but it's almost like it's either on or off. Isolating body parts is hard, but thanks to Megan, I've got some ideas of things to work on. How Leo feels about my riding, probably. The session ended on a really good note, especially considering where we stared on Saturday. My trainer actually really seemed to like him (I'm sure the floofy forelock and cute personality helped) and basically told me to keep him and see where we are in a year. Which is good, because I've already signed us up for a schooling show this coming weekend!